In the 1990s, the Intergovernmental Panel on Climate Change asserted that “climate migrants” would be one of the most dire consequences of climate change. This, at times contentious argument, centers on how climate change acts as a “threat multiplier,” exacerbating existing environmental and social factors that drive migration. A precise correlation is difficult to draw. But by 2050, climate impacts—flooding, erosion, and extreme weather events—are expected to displace between 50 million and one billion people. The international community has rightly increased its attention on the issue. Some experts argue that migration is simply a failure to adapt to climate change. Strategies should focus on helping people adapt “in situ,” or find sustainable ways to remain where they are. In many cases, this is an appropriate response, but that’s not always possible. What happens when staying put threatens survival? If our nomadic forbears have taught us anything, it is that remaining in one place is not always a good idea. There has been far less discussion on what we call “climate immobility,” how populations affected by climate change may not have the means (or the ability) to move to less vulnerable places—even when their survival depends on it. Migration has its prerequisites—adequate funds, contacts in the destination area, and the ability to avoid prohibitions on movement. Those who don’t meet these requirements are the involuntarily immobile. When you add rapid climate change to the picture, the need for mobility increases, and the inability to move could be catastrophic. South-central Somalia is a dramatic example of a place where people, suffering from drought and famine, need to move for food and shelter but simply can’t. For years, the insurgent group al-Shabab has forcibly restricted the flow of aid and people, keeping the international community out and preventing the development of vital disaster relief and preparedness. Somalia’s isolation brought a form of institutionalized immobility for its people. The impact of climate change on such an extremely vulnerable situation will be disastrous. While equally fragile places like Sudan and Afghanistan still offer—intentionally or not—channels for mobility, the further destabilizing effects of climate change could shut those doors. There are also cases where traditionally nomadic movements are forcibly curtailed. In northern and western China, current government policies center on “ecological resettlement,”—a policy that isolates minority herders in designated villages as a means to ‘save the environment’, but also to enhance social control. Ironically, with climate change looming, this policy of institutionalized immobility may both reduce the adaptive capacity of people in the region and put an end to customary livelihoods. Similar restrictions on nomadic movements in the Sahel, and strict prohibitions on “exit” enforced by closed regimes like North Korea, Burma, and Zimbabwe, leave a number of involuntarily immobile populations at risk. Population immobility can occur anywhere, from countries with highly restrictive regimes to those with barely a government at all. In any of these cases, the future effects of climate change will likely worsen an already fragile situation. 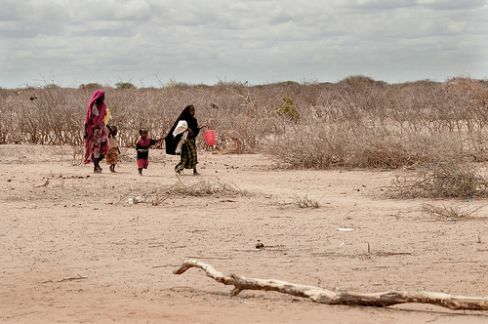 Though the international community has understandably focused on climate migration, more attention needs to shift to involuntary immobility in the face of climate change. A significant number of people are and will likely become immobile. Policy-makers will then need to find solutions that reduce the vulnerabilities associated with this—both through in situ climate adaptation plans and strategies that recognize the need to move, and move safely. To stay or go is a false dichotomy—climate change policies must accommodate real-life complexity, and case-by-case solutions. As ecological barriers shift, so, too, do human forces. The concern now is to find a way to integrate dynamic ecological and relatively static political boundaries with human lives and desires. To address climate migration, we need to also take into account its poorer twin, climate immobility. By Francesco Femia & Caitlin Werrell in China, climate immobility, climate migration, climate mobility, Somalia, Sudan on September 13, 2011 . Hello and thank you for interesting article. So-called environmentally induced migration is multi-level problem. According to Essam El-Hinnawi definition form 1985 environmental refugees as those people who have been forced to leave their traditional habitat, temporarily or permanently, because of a marked environmental disruption (natural or triggered by people) that jeopardised their existence and/or seriously affected the quality of their life. The fundamental distinction between `environmental migrants` and `environmental refugees` is a standpoint of contemporsry studies in EDPs.